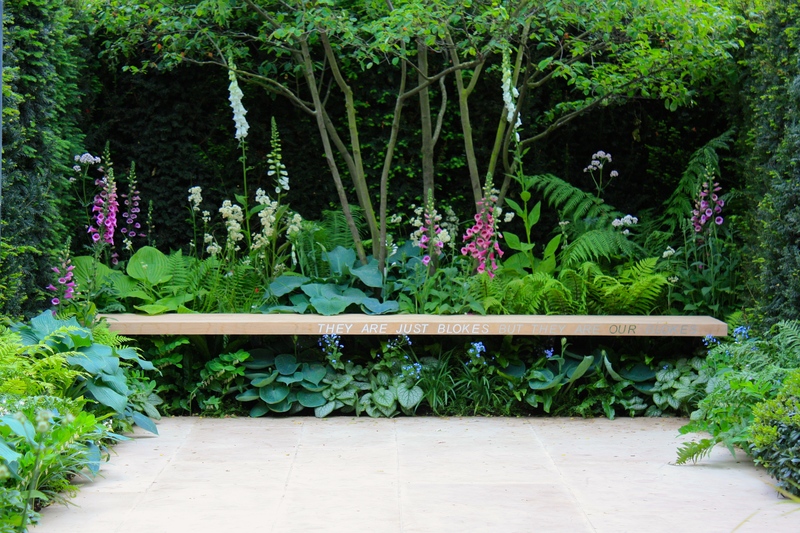 No doubt spurred on by TV talent shows, where the audience as well as expert judges get a vote, the RHS introduced People’s Choice awards at the Chelsea Flower Show in 2010. These awards reflect entirely the opinions of the public and are awarded in the Show, Fresh and Artisan categories. 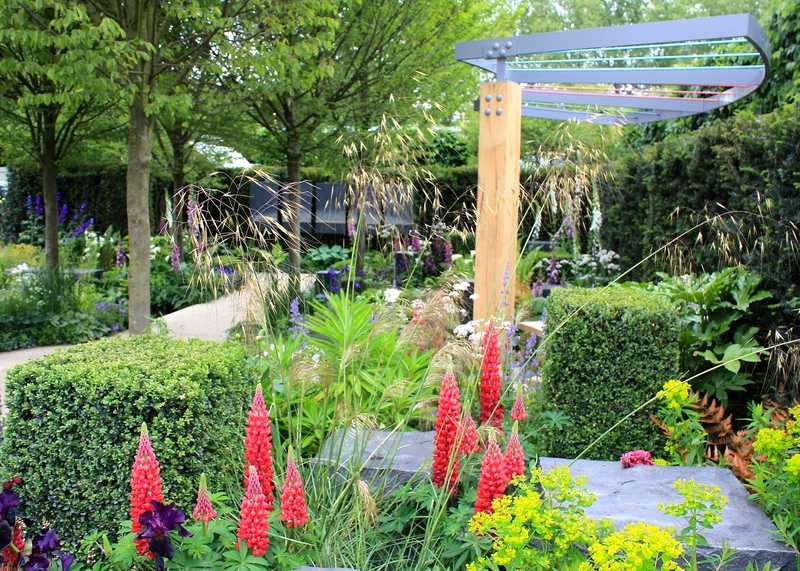 Triumphant in the show garden category this year is ‘Hope on the Horizon’, designed by Matthew Keightley in support of charity Help for Heroes. 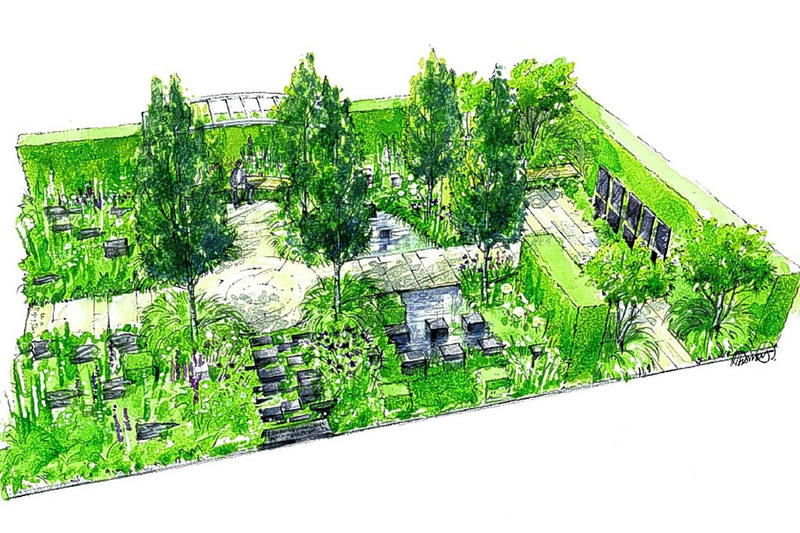 The garden’s design represents the path towards recovery taken by wounded, injured and sick military personnel, veterans and their families. Matthew, who has never designed a show garden before, works for landscaping firm Farr & Roberts and describes himself as more of a hands-on, practical designer. However with a brother currently serving in Afghanistan, he is well qualified to understand the sensitivities of the subject he’s been charged with representing. When the show ends to day, rather than being broken up or sold off, the garden will be carefully dismantled and transported to Chavasse, a Help for Heroes facility near Colchester, Essex. Here it will form part of a larger landscape for recovering servicemen and women to enjoy. Matthew’s garden, sponsored by the David Brownlow charitable foundation, is arranged along two axes, forming the shape of the military cross. At one end a sculpture by the Scottish artist Mary Bourne depicts the horizon. The piece is formed of five slate-grey panels set against a shaded, tightly-clipped yew hedge. An artist whose work explores mankind’s emotional, intellectual and physical relationships with the world we live in, Mary’s work is a great choice for this project. 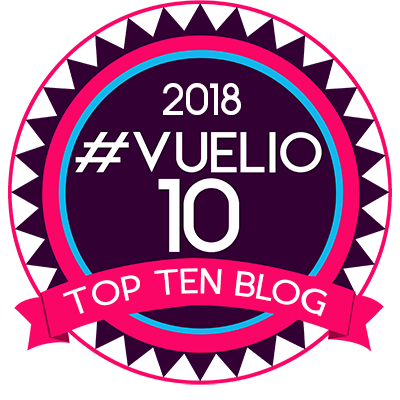 Visitors to the show will no doubt have been struck by the garden’s signature features, blocks of cool granite surrounded by clipped box and colourful, optimistic planting. The finish of the stone monoliths, which represent soldiers’ physical being, becomes more refined as one moves through the garden, describing a journey towards physical recovery. They end up dark, smooth and perfectly sawn, surrounded by crowds of soothing ferns and foxgloves. It’s a nice analogy, but practical too as the blocks might double as seating or pedestals for other sculptural pieces. Meanwhile, Matthew’s choice of planting is intended to represent psychological well-being. It becomes more structured and controlled as one progresses through the plot but is always colourful, uplifting and ultimately crowd-pleasing. There are tactile grasses such as Calamagrostis × acutiflora ‘Karl Foerster’, Stipa tenuissima (above, with Nepeta racemosa ‘Walker’s Low’) and Briza media, intermingled with herbs which will release their scent when soldiers brush past. I could have done without the lupins which, although pretty, contribute to a plant list which is perhaps overly long for a space just 10m x 15m. 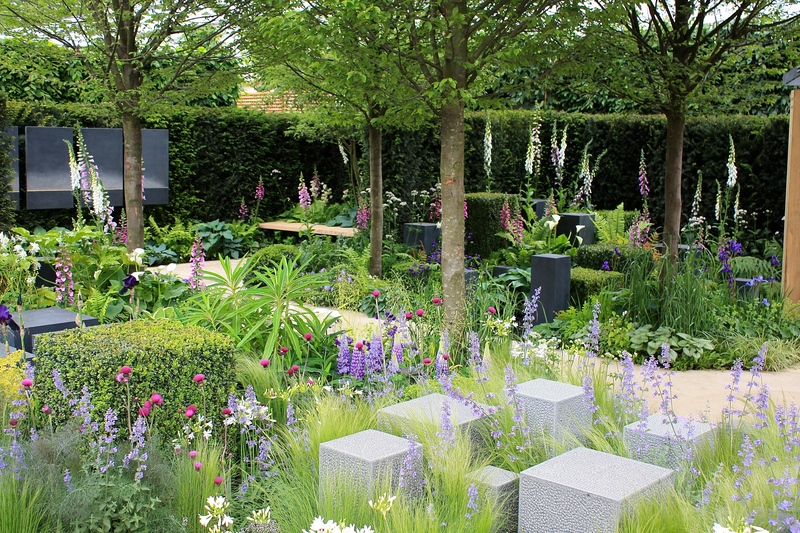 Not being someone who abides by the principal of ‘less is more’ I can hardly criticise, but I have a feeling the RHS judges may have had this in mind when they decided to award the garden a silver gilt medal rather than gold. My favourite part of Matthew’s design, the shorter cross axis, is terminated by a simple slab bench inlaid with the inscription ‘It’s about the blokes, they are just blokes, but they are our blokes‘. (I hope servicewomen everywhere will forgive their omission from this dedication.) Underplanted with hostas, Brunnera macrophylla ‘Jack Frost’, ferns, polygonatum and Liriope muscari ‘Big Blue’, this would be a tranquil spot in which to rest and contemplate the symbolism of this poignant yet hopeful garden which captured the hearts of the British public this week. Beautiful garden and it’s relevancy seems to be quite poignant on this Memorial Weekend here in the US. Indeed. Glad you enjoyed the post Judy. I can’t believe it’s only 3 days ago I was at the show. Feels like weeks! I really liked this garden too, despite the fact that I wasn’t that keen on the show gardens which were designed around a ‘journey’. 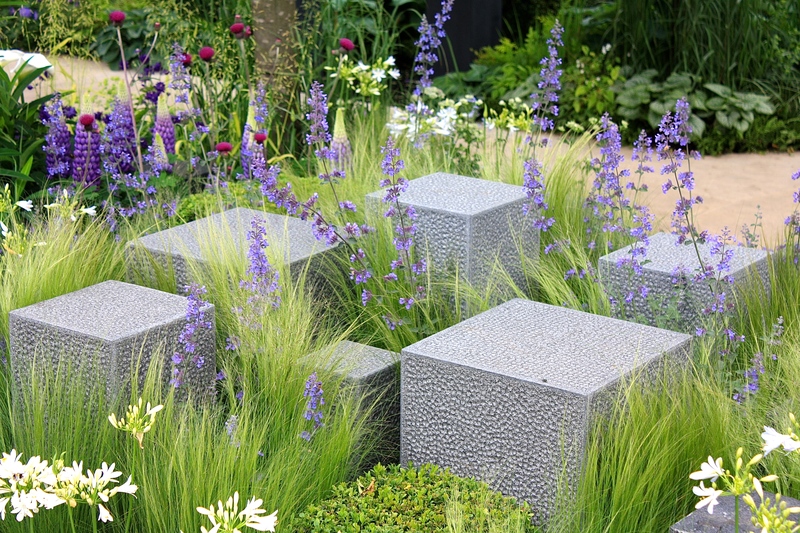 However, this one was cohesive in its design and the planting was lovely. By the way, did you enjoy Sissinghurst on Friday? It’s unusual to have the irises and roses out together so you had a bit of a bonus! Hi Helen. We had a wonderful time as always. Loved the vegetable garden and the views from there. It was the first time I had seen the azaleas and wisteria flowering in the moat walk. The lilies, eremurus and roses were absolutely beautiful. My friend from Australia was especially taken with the lawns – I don’t think they grow like that in Oz! Do you by any chance know the variety of the fuchsia in the lead tank to one side of the Tower Lawn (just near the gigantic osmunda)?